Who'd have thought that when Songs For Polar Bears came out all those years ago – an understated gem in the-then burgeoning Glasgow underground scene – its creators' fourth opus almost a decade later would be one of the most eagerly anticipated albums of 2006 by both the record buying public and critics alike? After years in rock wilderness, Snow Patrol were catapulted to the dizzying heights of the charts in 2004 with breakthrough single Run, taken from their album Final Straw, which went on to sell in excess of two million copies. Following world conquering touring schedules and the recruitment of a new bassist and keyboardist, Snow Patrol return with new album Eyes Open, a sprawling and epic rock masterpiece. Eyes Open is packed full of gargantuan choruses, clever pop hooks, and gentle and affecting wide screen classics. Bettering multi-platinum selling record Final Straw was never going to be easy, but with Eyes Open Snow Patrol have pulled it off. Produced by Garret 'Jacknife' Lee, the album was recorded in an isolated cottage in Ireland, and is a deeper, more mature sound from the Glaswegian band. As a songwriter, Gary Lightbody has an enormous talent, and this album is a major contender for album of the year. Opening single You're All I Have is an excellent introduction, a powerful, passionate song that sets the tone in a comfortable fashion. However, it is one of the weaker tracks here; Hands Open and Chasing Cars are miles better, showing a real progression to Lightbody's songwriting. Hands Open in particular is a delight, a stomping, thumping track, with some wonderful vocals. The album turns from one extreme to the other, from crunchy and audacious guitar riffage to beautiful and melodic heart-warming ballads. Chasing Cars is the latter. It is tender and raw, slowly building to a fabulous climax. Without a doubt a potential single. Then again, virtually every track this album delivers has the bones and blood to be a single. It's Beginning to Get to Me is also a great example of this albums strengths – a snapping rhythm set against some excellent lyrics. You Could Be Happy and Shut Your Eyes fall into the same camp – both have a child-like quality to them, the former with its music box accompaniment, Shut Your Eyes with its community singing and simplistic arrangement. Two tracks though stand out head and shoulders amid the rest. Set The Fire to the Third Bar features the voice of Martha Wainwright, and is a beautiful piece of music. Their voices merge perfectly, Martha slightly higher in the mix, sounding full of soul and passion. And then there is Open Your Eyes, a stunning song that slowly builds with a powerful vocal performance from Lightbody. Following the 4 x platinum success of their breakthrough record Final Straw, Snow Patrol have made a phenomenal leap forward in every sense with their new album. With a lifetime of experiences accumulated over the last 2 years, including touring with U2, playing at Live8 and becoming one of the biggest bands in the country Eyes Open is a song writing tour de force, and takes the band to a whole new level. Musically, there is a more polished feel to Eyes Open than on any of their previous long players, which suggests that the royalty checks from Final Straw were put to better use than enjoying a maximum rock'n'roll lifestyle. Certainly, employing Garret Lee to produce the record may have been a masterstroke, as despite the high number of big ballads on this record, the addition of several twiddly bits and drum loops in many of the right places helps reduce the schmaltz level by at least 50 percent. 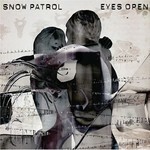 Overall, Eyes Open is the album that Snow Patrol were always going to make in the wake of their unexpected success. The only question is how can they top this? Surely the only way is down now. But knowing this group of musicians, who knows what’s up their sleeves.